Feel more secure every day in real-time with Eye Need a Witness. Nothing can beat real people working together to reduce crime. With Eye Need a Witness you can send an alert to anyone in the network, with a touch of the "Public" button, within 5 miles of your location including local police. The system uses GPS location and tracking to indicate your location in real time. The Eye Need a Witness Campus Alert sends urgent notice to anyone within the campus (university or college) network including campus security and local police. This app is intended to help prevent crime when danger or potential crime is suspected. Students can WITNESS, RECORD AND REPORT by using the text, photo, video or audio record features. Help is on the way. Once the network is alerted, the map shows your location (red icon), responding witness locations (black), campus security location (green) and local law enforcement location (blue) as they approach in real-time. The Eye Need A Witness tracking system uses the latest in Global Positioning System (GPS) technology and turn-by-turn directions are provided immediately. The tracking system uses real-time positioning making location detection extremely precise. Your data, images, videos and audio recordings are stored and archived in your library for future reference. Files are easily and conveniently retrievable from your archives at any time. Report a threat such as an active shooting, hostage or other dangerous situation that may require a special alert. Help STOP imminent danger and send an alert that can help save lives. This app turns your phone into a personal safety device. At the push of a button, Eye Need A Witness alerts other nearby users within your community in seconds. Potential witnesses receive the alert when a nearby caller requests a witness or sends a danger alert at a time when they may feel unsafe. 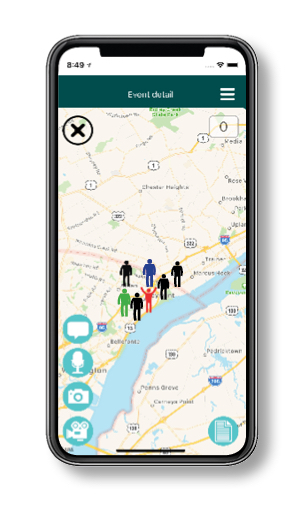 Both the caller and the witness locations appear on the map, along with any text, photo, audio, or video details that may have been sent with the alert. Other Eye Need a Witness users can only see the personal information you include in your user profile. Callers’ information will be shown to responding witnesses, and will only be displayed for the duration of the alert. Witnesses’ information will be displayed to a caller once they have agreed to be a witness and will be visible to the caller on an ongoing basis. Witnesses can see other witnesses’ icons on the map, but are not able to see their personal profile information. Your information will also be visible to any users you have specifically invited to follow you through the app. We encourage users to add a picture of themselves as well as a first name so that they can be recognized when alerting others and/or responding to alerts.